Felton Brushes has been manufacturing cremation brushes and many industrial brushes since 1933. Our brushes utilize the finest oil tempered wire from mills in Canada and the United States only. Felton offers only the best quality brushes in the business. Felton’s brushes last 50% to 100% longer than all other brushes. A Felton Brush will save YOU time and money. 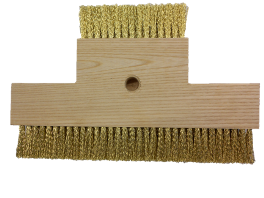 Our St. Pete’s brass brush has gained a lot of popularity thanks to it durability, long-lasting design and soft brass bristles engineered to not damage the hearth. The FB1290 crematorium oven sweep out brush from Felton will be the most durable sweep out brush you will ever use in your operations. The FB1290 is a 12″ dual stripped brush, which doubles bristle density and brush life compared to our competitors. The FB1290 also features high quality stainless steel bristles. The stainless steel bristles are softer than carbon steel bristles, which are used in almost all other sweep out brushes in the industry. This allows the FB1290 to be less abrasive on your crematorium oven’s floor, extending the useful life of the oven floor. The St. Pete Brush from Felton Brushes is the brush to use to maximize the life of your oven’s floor. The St. Pete uses the highest of quality North American brass wire, providing the least abrasive sweep out you will find in the industry.